Deep into the lower hills of Sri Lanka in Galle district, traveling South, along the tea plantation, rubber trees and coconut plants Upali aaiya turns the Japanese SUV to the left. As we pass a highway under construction, road narrows. On the sides we pass recently planted paddy fields. We stop and Mr. Kannagara rolls down his window and mutters something in Sinhala that appeared to be asking for direction. The lady points straight ahead. We drive 200 meters and the mud road forks. We stop again. Upali aaiya asks another villager and turns the vehicle to the right. The road narrows further. We move 50 meters up the hill. A vehicle approaches from the opposite direction. The mud-road is so small we have to back off to let the other vehicle pass. We drive up the slope and houses begin to emerge. Road narrows further. Because of the last night’s heavy rain, it looked slippery. We wonder whether the vehicle will pass through a small ditch. Upali aaiya puts on the 4WD. We move slowly. After passing a few houses on the both sides of the narrow road which barely seemed 4 feet wide, we stop at a one story house. It looked newly constructed. House is void of any furniture. A new 20 inch TV looks out of place. Mr. Kannagara jumps out. We follow. A woman emerges out of the room – barely 5 feet tall, she recognizes Mr. Kannagara and joins her hand to say, “Ayubowan”, the Sri Lankan greetings. Three children follow her. The woman is Mrs. M.L.Chandrawati, a single mother of five children. She is also the sole take care of an old mother-in-law and a cousin, who has development disabilities. On the day tsunami struck, her husband, sole breadwinner of the family, had gone to a vegetable fair in Matara. He never returned. When a newspaper ran a story on family’s plight, Mrs. Ariyaratne, who runs Sarvodaya Suwasetha, drove to the village to meet the family. 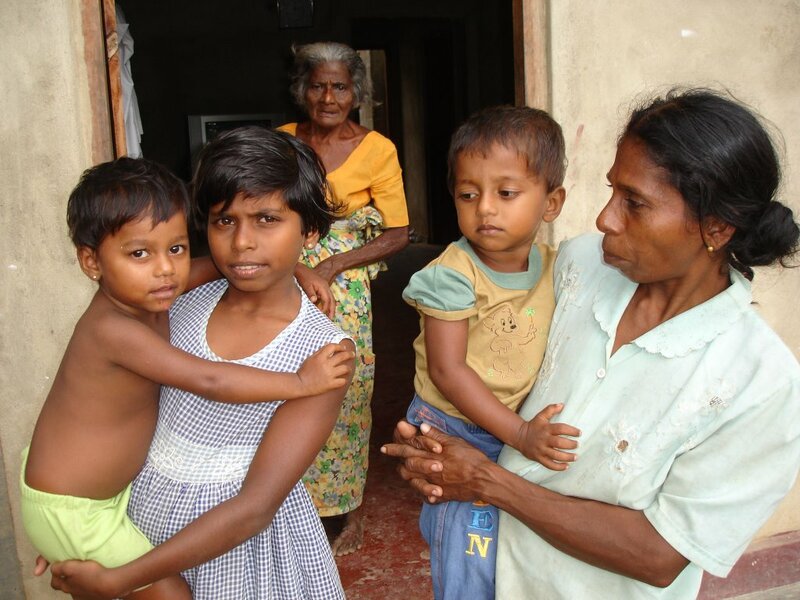 Sarvodaya supported in building the new house and has committed in supporting the children with Sarvodaya Suwasetha Sponsorship Program, which provides Sri Lankan Rupees 1,500 per child per month.